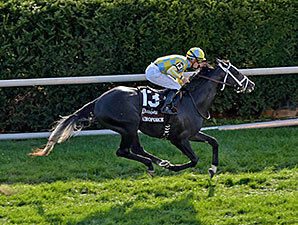 Ridden by Julien Leparoux for trainer Mark Casse, Airoforce, a Colonel John colt, sat just off the early pace set by longshot Argot, rallied three-wide off the final turn and held off the late run of Camelot Kitten, who was far back early, to win by 1 1/2 lengths. Siding Spring, another Casse trainee, finished another half-length back in third. The final time for 1 1/16 miles on turf rated yielding was 1:44.12. Airoforce paid $12 to win in an evenly matched field of 14. Airforce, bred in Kentucky by Stewart Madison, is out of the Cuvee mare Chocolate Pop. After his win at Kentucky Downs Sept. 5, he worked well twice on the dirt at Churchill Downs before the Bourbon. The Casse stable won four races in the first three days of the Keeneland fall meet.